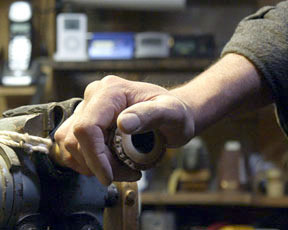 Tai Hei Shakuhachi offers a complete service for the repair and restoration of vintage instruments. This includes not only fixing cracks that have developed in the bamboo, but replacement of damaged utaguchi, rebuilding the loose nakasuké joint in two-piece flutes, repairing or replacing nakasuké rings, cosmetic enhancement of the root end, as well as renewing the damaged precision bore of a shakuhachi to its original condition. Tai Hei Shakuhachi also offers a Free Evaluation , retuning and bore enhancements of traditional instruments that may be in good physical condition, but have acoustical and prerformance problems related to pitch and resonance. Resonance governs how much air the flute will accept and how hard the sound can be pushed. Any shakuhachi, including the most primitive plastic plumbing pipe models, will perform adequately in this area if the player blows softly. As more air is introduced into the bore and blowing becomes more intense, the higher partials or overtones of the sound are exercised giving the shakuhachi its distinctive ringing tone. If the bore profile of an instrument is not properly designed and rendered to a very precise shape, there are acoustical consequences. Unwanted vibrato, notes jumping into higher octaves, instability and weakness of tone and, in extreme case, the inability to produce a clear sound at all are just a few manifestations of resonance problems. Resonance is clearly the most important issue involved in the performance of a shakuhachi. It is the domain in which most instruments are likely to be deficient, but also one that is most correctable. The hanko pictured reads "Retuned by Ku Setsu". Appearance on a shakuhachi guarantees that the instrument has been evaluated and undergone a complete performance upgrade, including retuning and bore enhancement, to improve its acoustical and performance qualities. Over the years, Tai Hei Shakuhachi has been commissioned to do restorations and performance upgrades on many rare and vintage flutes as well as on the personal instruments of professional players in Japan and around the world. These include shakuhachi crafted by such famous makers as Shigemi Inoue, Sr., Kono Gyokusui, Sr., Kawase Junsuke, Sr., Nishimura Koku, and very rare instruments marked with the hanko of legendary shakuhachi masters Jin Nyodo, Aoki Reibo, Yokoyama Rampo, Miura Kindo, Miyagawa Nyozan and others. "The flute arrived yesterday all well and sound. I had a chance to play it yesterday and it sounds very nice. The RO and Tsu are transformed in a positive way. Also I noticed the tuning improvement and the improved balance between all notes. What I especially like is that now I can play long notes ending in silence easily, which was not so before. I think this flute has another many years to live and I'd like to thank you for your great work you have done. If anytime I need to upgrade a flute, I know now where to turn." " I just received the flute and it is beautiful. It plays better than it ever did. Now you have spoiled my plans to sell it. I have always liked the big holes it has (unusual for a 1.6). Anyway, as always, you do great work. Thanks so much." "I received my Shakuhachi safely back from you a few days ago. It took me a couple of days to really play it. I was thinking, nobody can help this poor instrument, it's not Monty's fault. "Today it's raining here. Since I'm stuck inside I was really trying it out for the first time. I was playing along with a recording I have by Kohachiro Miyata playing Akita Sugagaki. When I reached some of the usual 'tone poor' privately embarrassing spots for me, I stopped in surprise. What the heck? Was that my instrument's sound? I took off the headphones and thought, better do this again. It WAS my sound! . . . a very good sound! "I don't know what to say. I am truly amazed, shocked, bewildered, and struggling to believe that this is the same dull, boring instrument that I sent to you. You see, I had purchased it against my better judgment without auditioning it, and have been sorry ever since. "Having my Shakuhachi refurbished by you did more than fix the instrument. It caused me to take a really good look at my current technique and the acquired bad habits a good instructor would have caught. "Thank you Monty, for your knowledge, diligence, and patience with this. I'm very happy." "The flutes arrived home today. I wanted to write you and thank you for all the incredible work. They are functioning better than ever. The sound and resonance is amazing. The bindings are artfully done. Overall, I am very pleased and will be forever grateful for your efforts and care." "Monty, My flute arrive safe and sound and once again I am amazed at the quality of your restoration work. I truly had to search for the gaping cracks that were at one time on the shakuhachi. The instrument plays very well, and startled me with its sound projection and tone color. It also is surprisingly easy to play. As always, thank you for your work." "Hi Monty, My repaired, refurbished, and newly inlaid rattan-bound shakuhachi arrived just before noon today and I'm thoroughly delighted! What a treat! And how beautiful it is to see and feel. I treasure this flute and the upgrade seems a fitting way to celebrate the progress I've made at playing shakuhachi. Thank you also for filling the two minor cracks, I see how expertly you did so. The improvements you have made to my shakuhachi are remarkable. Your work is superb and the results are a marvel to behold. Thank you again. My shakuhachi teacher sends his regards as well." "Hi Monty, Now the 2.0' shakuhachi is in my hands. I am totally happy with the result! The flute looks much better than before. The ro and tsu are stable with volume without jumping into the octave when blowing hard. Yeah!!!!! And it feels good to hold with the little bigger fingerholes. I appreciate your exact and efficient work! Thank you very much." "Hi Monty, My shakuhachi arrived today in good condition. It is beautiful with the black/silver nakasuke rings and plays so easily with a lot more subtle volume, especially the RO and better pitch and tone. I'm sooo excited to play it again and have it back in my hands. You are a master and I thank you for all the work you did to restore this vintage shakuhachi." "Hi Monty, I hope you never get tired of receiving this kind of feedback-you've once again worked magic in restoring a flute to a condition that its owner could not even imagine. I've only just unwrapped it and of course, it's beautiful to look at, really superb. The bindings are clean, the new joint is wonderful, the repairs and hole adjustments are barely detectable, and the filling that you've done not only solved some serious structural problems, but it's also perfectly matched to the color, shape and overall appearance of the instrument. It doesn't look like a new repair, but rather an integral part of the flute. "The very little bit of playing I've had a few minutes to do produced sounds not heard in the 15+ years I've owned the flute. The low Ro really rings now, and that was before either I or the flute had a chance to warm up. Overall the sound is brighter and more rich at the same time, and my initial impression is that the tuning is greatly improved. "Now that I've been playing the flute nearly every day since you sent it back, I'm triply impressed. The tone that you've given it (or maybe given back to it) is really astounding. Your assessment it accurate: the pitches are right on, and it's a responsive, beautiful instrument capable of producing a variety of tones and shades. Again, it's so much more than I imagined was possible. It's so satisfying to have my old flute back, only 10 times better than it ever was! "Thank you so much Monty. You really have done a remarkable job." "Hi Monty, The Zenmura 1.8' you restored arrived today. I am so happy. Can't express my appreciation. You have done extraordinary work on this flute. It sounds very fine with a darker and softer tone colour and it is well in tune now. Beautiful bindings and a great utaguchi. Thanks a lot again - you have created a new art work!!" 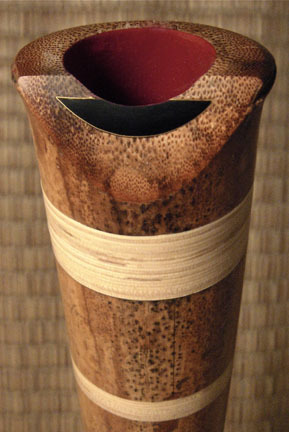 "Dear Monty, Thank you for the devotion and dedication you showed while working on my 1.7 Edo period shakuhachi. You kept all of the historical aspects of the flute intact, such as the "sweet" tone color and original bore shape, while improving the playability, tuning and overall volume. The crack is also invisible. All I can say is, you sure know your craft. I was blown away when the flute found it's way home (in three days) and I began to play it. Amazing." "Monty, thank you so much for the work you have done on my shakuhachi. When it cracked I was devastated. Your repair work is nothing short of outstanding. Not only have you repaired it taking great care to mantain the aesthetics of the instrument, but your enhancement of the bore and utaguchi has lifted its playability and sound to a level far beyond its original state. All my friends and acquaintances (musicians themselves) who have experienced the 'before and after' sound of my shakuhachi attest to this too. I am looking forward to playing the shakuhachi you are currently making for me. Monty, may I also congratulate you on your web site and the valuable service you offer. As an educational resource it is priceless. Without Tai Hei Shakuhachi, shakuhachi in the West would be a lot poorer. Thank you." "Monty, The flute arrived yesterday. You've done a lovely job and it sounds absolutely wonderful . . . great to be in western pitch also. It glides through the registers with ease and produces a beautiful sound. The enjoyment of the new flute experience that you have created gets better daily. The only problem is that I can't put it down! Thank you again for the extra work you carried out, its very much appreciated." "Hi Monty, I rescued my flute from the clutches of FedEx last Friday, unwrapped the flute, and was immediately impressed with how good it looked. You can't tell that it was once a 7-hole flute since you so expertly filled in the lowest hole and then bound over the other hole. The lacquered urushi-colored binding complemented the refurbished and re-painted bore, and the color of the bamboo (just like you suggested). The new utaguchi was much appreciated. All that you reported about the sound (rich strong tone with a large envelope of sound) after "tweaking it" was absolutely true, and I am amazed that a flute that was originally about 20 cents flat overall , came back tuned to Western standard pitch and with such a well balanced sound. I was amazed at how softly,and loudly, I can play this flute. The more I play it, the better it gets. Truly, I bought this inexpensive 1.6 flute to play the occasional piece with, not too worried if it got knocked around, and hoping it sounded OK playing honkyoku. Instead, I received a beautiful flute with a beautiful sound. Thanks again for taking such good care of it." 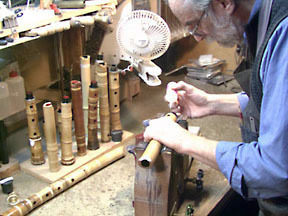 "After many years of being frustrated at the inferior quality of repair work done on Shakuhachi in the United States, and after having used a number of different craftspeople to do my repair work, I have come to the conclusion that I will only be using Monty Levenson for all future repair work. I would highly recommend all to do the same. His work is consistently high in quality and reasonable (actually low by Japanese standards) in price. And, of course, its always a pleasure to do business with Monty, whose dignity, compassion, and character are the tops." "Dear Monty, Just got back to Japan yesterday. Thank you so much for your hospitality and time, and really number one in my mind, for what you did with my flutes. My hassun is just so much better! As I prepare to play a concert scheduled for this weekend where I will play three honkyoku, I marvel at how much more I am getting out of this flute. It really has become a mother of an instrument! Monty, you can put your stamp on it any time. You brought it back from the dead. Again, thanks to your work." "What can I say Monty. You have resurrected two of my shakuhachi that I'd almost given up on. I'm getting a deep-full, resonate 'RO' from the 1.8. Thanks for re-building the mouth piece for me too. This flute has become one of my favorites. The 2.3 no longer jumps an octave when playing Ro. It also plays much stronger. The tuning is better too. Thank you so much for your excellent work and thanks for being there for me." Shakuhachi teacher who studied in Japan with Katsuya Yokoyama and Nakamura Akikazu. Auther of Blowing Zen: Finding an Authentic Life. "It has been almost 5 months since Monty reworked the bore of my 50-year-old shakuhachi. The lacquer was pealing off, its unpredictable responsiveness was becoming more and more of an issue for me, and something had to be done to save the instrument. I gave him permission to do this with great fear and trepidation since it was my only instrument and I had paid what I felt was a great deal of money for it. Well, what can I say? Let me quote my initial response to him because it is as true now as it was then. 'This is absolutely fabulous! I only had to put it to my mouth and blow a few notes to feel the full effect of the changes. WOW!' Thanks so much Monty for giving me and my flute new life!" "Well, my flute arrived safely yesterday. I must tell you, the flute looks so much better! It was always a beautiful instrument, but it now seems to have new life. I think the sound is also better than ever. Monty, I cannot even see where the new crack or the old repair were! What a fantastic job you did. And the inlay rattan bands are stunning and elegant. The bore looks fantastic. When I played a little last night, the dogs came up very excited and wanted to investigate the flute anew. This is how I know the sound is good - when the animals respond with pure joy! I am so grateful for the exceptional and timely work you did on my shakuhachi." "The flute arrived safely! Thanks for the great work. You've turned the old flute into a gem! Very, very good resonance, intake of breath is excellent, can be powerful and bright, but also mellow and elegant. I would say that among all flutes I have ever play as a newbie, this flute has the best sound and hand-vibration feeling for me!" "Just got my instrument. It is MAGnificent. I feel like an old friend has come home. The tone, harmonics and overtones are incredible Monty. I just love it. You have performed alchemy. The esthetics are tremendous as well. You did an excellent job of the binding and don't think I missed that added touch of the rattan at the top. I love the whole thing. Thank you infinitely. Back to the Dojo." "My newly repaired flute is a testament to your years of experience. You managed to free it`s voice whilst keeping, indeed enhancing the original tone quality. It is a joy to play. Thank you very much." "I returned from Europe last Friday evening and of course the first thing I did was unpack the Shakuhachi you worked on. Can’t put it down now—it really is beautiful. The sound is much more even and full. I can really crank it up into trumpeting otsu notes and singing kan notes and play soft and delicate tones as well. The dai kan register is also much better than it was before particularly dai kan re, which use to be quite difficult to play.The ascetic enhancements are also great and look very natural. I think if you didn't know they were recently done, you would believe they are original. Very neat job on adding the three roots. The flute plays and feels like a new and much improved instrument. Thanks so much for the great work and also how quickly you completed it." "I sent Monty an old shak that had a few problems my main concern being the amount of effort necessary to play the 2nd octave C and 3rd octave D on a 1.8. He emailed me an evaluation the same day he received it stating what other problems existed as well. After the work was done and I received the shak I was extremely happy with the results. Every aspect of the shak from intonation, to playability, balance between the notes, etc. was improved greatly without affecting the tone color, which was a major concern of mine. All this in only three weeks time. Monty is truly a miracle worker making this old shak a pleasure to play." "Monty, are you absolutely sure these were the same shakuhachi that I sent you for repairs? They are both, in their own ways, stunning—your repairs and workmanship are, as always, perfect. Thank you very very much for restoring both instruments. The 1.7 is amazing. This one will take a lifetime to grow into. The transformation that you achieved is unbelievable. I am really intrigued by the physics and the alchemy that ground your work and your innovations—how precise and studied perturbations of the bore can result in such improvements in the quality of sound is a testament to your years of study and refinement of the science of acoustics. Your early model flute is now a constant companion to and from work now, and reminds me daily of how craftsmanship, honor, and good karma all work together."